Scientists studying the Chicxulub crater have shown how large asteroid impacts deform rocks in a way that may produce habitats for early life. Around 65 million years ago a massive asteroid crashed into the Gulf of Mexico causing an impact so huge that the blast and subsequent knock-on effects wiped out around 75 per cent of all life on Earth, including most of the dinosaurs. This is known as the Chicxulub impact. In April and May 2016, an international team of scientists undertook an offshore expedition and drilled into part of the Chicxulub impact crater. Their mission was to retrieve samples from the rocky inner ridges of the crater - known as the ‘peak ring’ - drilling 506 to 1335 meters below the modern day sea floor to understand more about the ancient cataclysmic event. Now, the researchers have carried out the first analysis of the core samples. 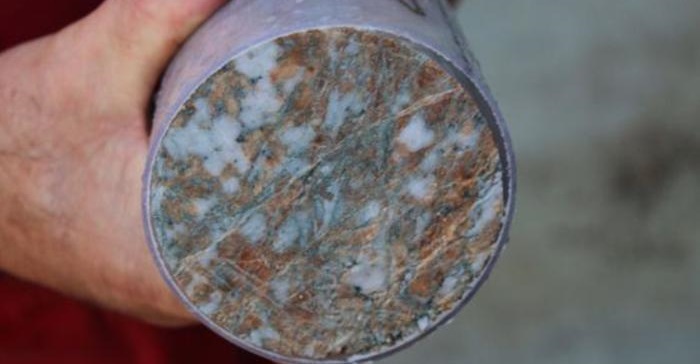 They found that the impact millions of years ago deformed the peak ring rocks in such a way that it made them more porous, and less dense, than any models had previously predicted. Porous rocks provide niches for simple organisms to take hold, and there would also be nutrients available in the pores, from circulating water that would have been heated inside the Earth’s crust. Early Earth was constantly bombarded by asteroids, and the team have inferred that this bombardment must have also created other rocks with similar physical properties. This may partly explain how life took hold on Earth. The study, which is published today in the journal Science, also confirmed a model for how peak rings were formed in the Chicxulub crater, and how peak rings may be formed in craters on other planetary bodies. The team’s new work has confirmed that the asteroid, which created the Chicxulub crater, hit the Earth’s surface with such a force that it pushed rocks, which at that time were ten kilometer beneath the surface, farther downwards and then outwards. These rocks then moved inwards again towards the impact zone and then up to the surface, before collapsing downwards and outwards again to form the peak ring. In total they moved an approximate total distance of 30 kilometer in a matter of a few minutes. The next steps will see the team acquiring a suite of detailed measurements from the recovered core samples to refine their numerical simulations. Ultimately, the team are looking for evidence of modern and ancient life in the peak-ring rocks. They also want to learn more about the first sediments that were deposited on top of the peak ring, which could tell the researchers if they were deposited by a giant tsunami, and provide them with insights into how life recovered, and when life actually returned to this sterilized zone after the impact.